UPDATE: Please see the comment below for a further identification of Edith Witham Doe. 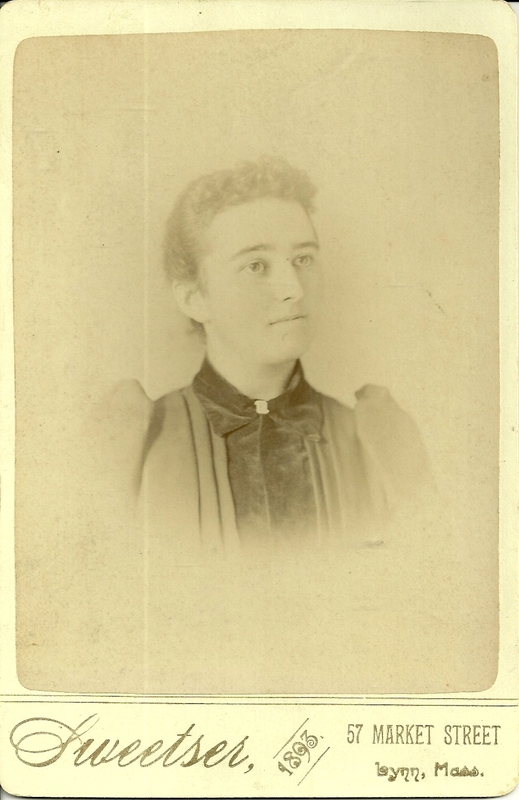 Photograph of a woman identified on reverse as Edith Witham Doe, Charlie's sister. The photograph was taken by Sweetser studio, 57 Market Street, Lynn, Massachusetts. 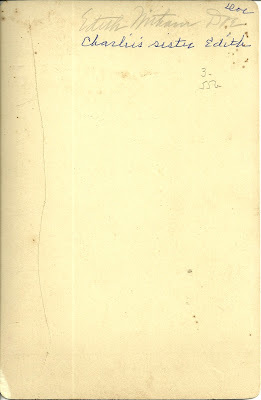 The original identification of Edith Witham Doe in pencil was amplified by handwriting in pen noting that she was Charlie's sister. I came across this photograph by accident, and I'm fairly sure that this Edith is the mother of the boy in a photograph I researched back on September 16, 2010: Ralph Doe. The handwriting in pen is the same as the handwriting on Ralph's photo. From online research, I had found that the mother of Ralph Doe was Edith Whitman. 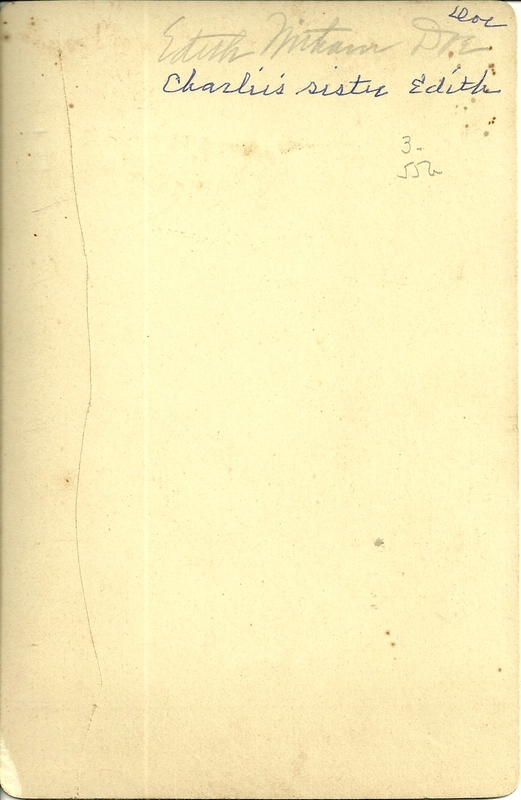 This photograph appears to have the same handwriting, yet Edith is identified as Edith Witham Doe. I believe, however, they are the same person. Perhaps the person identifying Edith was remembering incorrectly or had heard her maiden name incorrectly. Or perhaps her maiden name was Witham, and my earlier research was in error. I found an Edith Whitman, born about 1871 in Maine, living with her parents Thomas and Emily Whitman in Boston, Massachusetts. This Edith had an older brother Charles. I also found an Edith Witham, born about 1865 in Massachusetts, living with her parents Henry and Maria Witham in Gloucester, Massachusetts. This Edith had a younger brother Charles. I believe the Edith in this photograph died in 1900; sadly, her three sons died in infancy or boyhood. If you have any information on the Edith Witham Doe [or Edith Whitman Doe] in the photograph, please leave a comment in the comments box or contact me directly. Thank you so much for posting this. Everything does seem to point to your Edith. Edith and her sons died so young... I hope James was able to find happiness later on.